Welcome to the annual Midland BikeFest and the Gateway to the North. It is a time to reconnect with old biker friends, meet new ones and the perfect way to end the summer season. 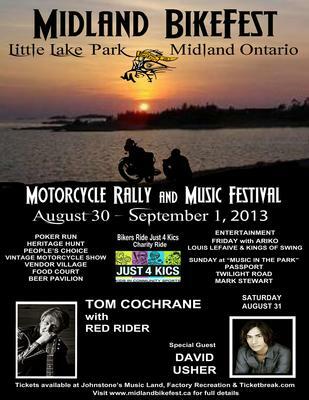 At the 2013 three day rally, both motorcycle riders and passengers can join the weekend festivities. Your registration fee includes participation in the Bikers Ride Just 4 Kics Charity Ride and Parade, Poker Run, Heritage Hunt, People's Choice, and all concerts including Saturday's huge concert with David Usher opening for Tom Cochrane with Red Rider. A swap meet will be set up for all your finds. Travel the beautiful countryside on this 100 km Ride and Parade through Huronia encompassing Midland, Penetanguishene and the Townships of Tiny and Tay for kids in community sports. The Midland BikeFest is proud to support Just 4 Kics as the focus of this Ride and with your help, in turn help their endeavors. Just 4 Kics (kids in community sports) is a registered Canadian charity dedicated to helping families and their children to overcome the financial hurdles which would otherwise allow their children play a sport or recreational activity. Every child deserved the opportunity to be the next great one. Just 4 Kics believes through these efforts the children will become healthier, be more active, make new friends and become confident, respectable young men and women of tomorrow. The Midland BikeFest believes this as well. All proceeds of the pledged Bikers Ride Just 4 Kics and the poker run will go directly to the charity. We welcome all spectators to come by Little Lake Park for free. Talk to the bikers, enjoy the food and licensed beer tent, walk through the vendor village, and admire the motorcycles including vintage on display by picking your favourite People's Choice daily. Listen to the music on Friday night with Ariko & Louis Lefaive and the Kings of Swing and on Sunday afternoon with Passport, Twilight Road and Mark Stewart. Little Lake Park will be closed off Saturday at 4:00 pm and only motorcyclists and passengers who are registered and the general public who have purchased a ticket to the concert with David Usher & Tom Cochrane with Red Rider will have access to the park. Tickets are $50 and available at Johnstone's Music Land, Factory Recreation in Midland or online through TicketBreak.com for the rally and the concert. This is one rally & music festival you don’t want to miss.